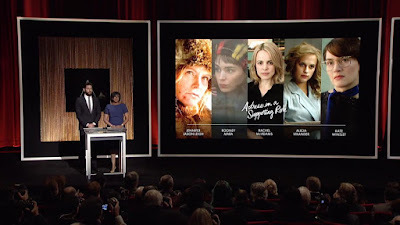 Del Toro and Lee announced the nominees in 11 categories at 5:30 a.m. PT, followed by Boone Isaacs and Krasinski for the remaining 13 categories at 5:38 a.m. PT, at the live news conference attended by more than 400 international media representatives. For a complete list of nominees, visit the official Oscars® website, www.oscar.com. Official screenings of all motion pictures with one or more nominations will begin for members on Saturday, January 23, at the Academy’s Samuel Goldwyn Theater. Screenings also will be held at the Academy’s Linwood Dunn Theater in Hollywood and in London, New York and the San Francisco Bay Area. Active members of the Academy are eligible to vote for the winners in all 24 categories. The 88th Oscars will be held on Sunday, February 28, 2016, at the Dolby Theatre® at Hollywood & Highland Center® in Hollywood, and will be televised live by the ABC Television Network at 7 p.m. ET/4 p.m. PT. The Oscar® presentation also will be televised live in more than 225 countries and territories worldwide.